by Robert Putnam, David Campbell. Simon & Schuster, 2012. 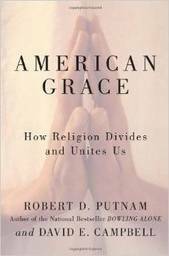 Putnam and Campbell make the case that religion still strengthens the American common good, particularly in the way many religious people, despite deep cultural divisions, practice tolerance and appreciation for others. Not all the news is positive. The authors’ describe the fall of religious observance traced to the 1960’s. They then move to observations about the rise of evangelicalism and the Religious Right, taking place in the 1970’s and 1980’s. Beginning in the 1990’s an increasing number of young people have left organized religion. However, the theme of decline is balanced by signs of hope, or what the authors’ mean by the term American Grace. Religion can support neighborliness. Religious people are often tolerant of individual differences. For example, this research shows that what used to be a bias against Roman Catholics has all but disappeared. Evangelicals show more respect to others than what many media reports might suggest. Jews are the most broadly popular religious group. Personal interfaith connections are strengthening. People are increasingly more likely to know and befriend those of other faiths. This book is written in a clear, accessible style. It is highly recommended for clergy persons seeking to interpret for congregants the context of contemporary religious life.